These three menu items are painted in big letters on the big windows of a big Mexican restaurant I frequent. Incidentally, they serve their version of an item called queso fundido ("cheese melted"). Queso fundido, when manufactured and operated correctly, is arguably the best Mexican dish on the planet. Anyway, back to the window signs. Below is one from a different Mexican restaurant near me. This appeared in roughly May of 2005, and the last time I checked it was still there. 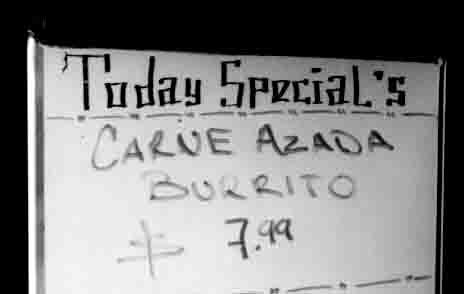 Note also the capital "L" in "specials" but the lower-case "L" in burrito. You can see several more next.